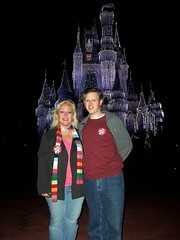 I finally finished posting the pictures from our 5-year anniversary trip to Disney World. As I mentioned before, we made the trip without Emily and Kendall. It was wonderful to be able to go at our own pace -- taking our time when we wanted (with no one telling us they were bored) and hustling through the crowd when we wanted (with no one asking to be carried). We were also finally able to ride together on all the rides with height restrictions (since Kendall is still not tall enough, and Emily is too scared for most of them). Without the kids to slow us down in the mornings, we were able to make rope drop on three occasions. As such, we were able to ride Toy Story Mania twice one morning and on another occasion rode Expedition Everest four times in a row. Meals were a particular joy, not having to plead with the kids to eat or to simply sit still. We took advantage of the Deluxe Dining Plan and dined at an array of the fancier restaurants. Almost everywhere we ate gave us some sort of treat for celebrating our anniversary -- from champagne to special desserts. There's a whole separate photo gallery with pictures of our food (since Misty says this is a popular theme on DISboards). Disney World was all decked out in holiday glory. There were huge Christmas trees in every resort and each of the theme parks. We made sure to visit the Grand Floridian to see the giant gingerbread house. Over at the Boardwalk we saw their gingerbread gazebo with Donald, Daisy, and Stitch made of chocolate inside. It's all edible, but the thought of destroying the creations seems cruel. Even the Polynesian had statues of Lilo and Stitch crafted out of chocolate. The Magic Kingdom was particularly spectacular. Main Street USA was strewn with wreaths, garland, lights, bows, presents, and even life-sized toy soldiers. Cinderella Castle was almost completely covered in lights, and we enjoyed a short lighting ceremony one night where the characters debated how to decorate it. We stuck around for Mickey's Very Merry Christmas Party (despite not having the extra event ticket) and watched another Christmas show in front of the castle and the Christmas parade. On our last day of the trip, we won dream pastpasses (again! ), so even though we'd planned to get on the road early, we stuck around for a while to ride all the big rides in the Magic Kingdom with no waiting. It was our third trip to Disney World this year (since we bought annual passes) and we're planning to head back again in February. The girls will be along for the fun then. As much as we enjoyed the trip by ourselves, I don't think we'll ever be able to go without them again. For one thing, I don't think they'd stand for it, but also, we just missed them too much.